When I was 4, when I woke up one morning.. I remember grandaunt holding a can of Brown and Polson cornstarch, that she fondly calls as butterfly powder. She looked at me and said, today I'll make something delicious for you with this butterfly powder. I saw her chopping up a chicken, marinate a big plate of it for a few hours. Then I saw her frying them. When it was my dinner time (Yes, I am always the first to eat at 5pm), grandaunt gave me my favourite part, the middle wing. Then she told me, it's my birthday. That's why we have fried chicken today. Being so young, I hardly knew what are birthdays, let alone my own birthday. In those days, children's birthdays were usually not celebrated, only birthday of old people are celebrated. This fried chicken is the favourite of many in the family, still is. Only made by grandaunt for Chinese New Year and birthdays. My 3rd uncle tried to replicate, but it didn't match grandaunt's. I tried it a few times too, and finally got it right. I do remember what she put in, but sometimes the proportions are not right. 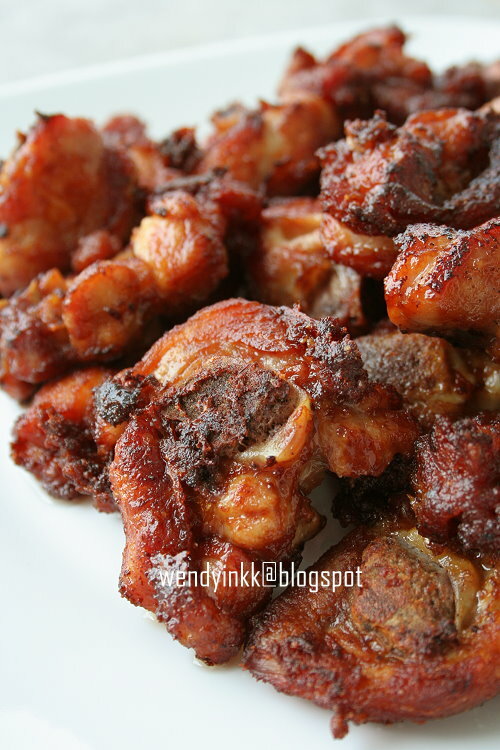 Grandaunt usually dips her finger into the marinated chicken, taste then spit. Haha, that's how she perfects each recipe, by using her senses, comparing to whatever that is stored in the palate's memory bank. This method of doing fried chicken is not exclusive to grandaunt. I eaten similar tasting chickens at a few eateries. But nowadays there are so many styles of fried chicken that this method seems old fashioned by now. I'm still trying to replicate grandaunt's recipes and get them right. It's not easy because the only record we got now, is the memory bank of our palate and it's been 20 years since I've last eaten her cooking. 1. 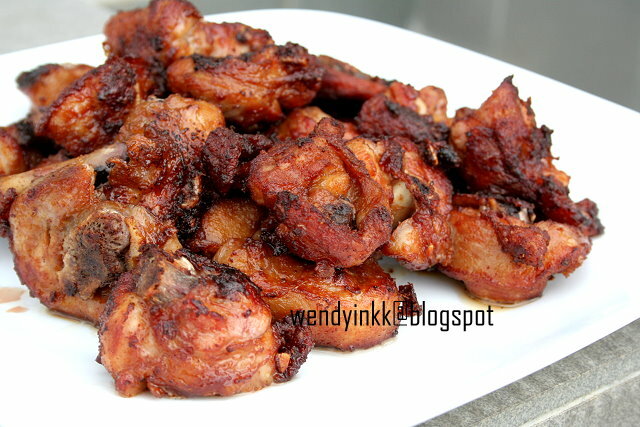 Chop chicken into small pieces and mix with all the seasonings except cornstarch. When everything is well mixed, then put in cornstarch and mix again. (I use my hand and rub everything in, that's how grandaunt does it). 2. Cover and let it marinate for 2-3 hours. 3. Deep fry the chicken pieces until very golden and surface is dry. Yes, that' how u get ginger juice, just squeeze with your hands. Anything with ginger is not recommended overnight. Wendy thanks for the recipe and your photo always make food look SO good !! Love fried chicken, but for obvious health reasons, limit it to once in a while. Alamak, wendy , What a coincidence again! 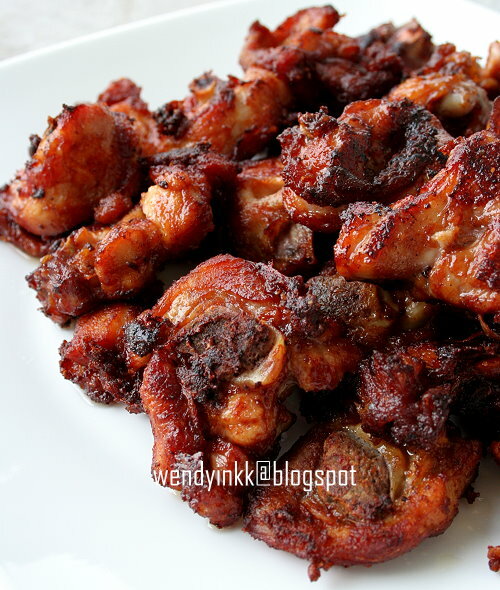 I prepared the sinful fried chicken on Saturday last, the KFZ version ala layymama style leh! hahaha...... High 5, kawan! Wendy, I also want to make fried chicken! colour looked nice, and it look tempting also! looking at photos of your fried chicken is making me hungry!! going to try the addition of ginger juice as I've never tried that before! look so yummy, I need to try this, But what is dark caramel sauce? is that similar with soybean sauce ? Any reason ginger cannot marinate overnight? Any reason things with ginger cannot marinate overnight? The enzymes of the ginger will make the meat turn mushy. It will taste powdery when eaten. Hello, id like to ask what temperature to fry them? Is it deep fry in high heat or boil in oil in lowest heat? I wasnt sure of the high heat n thought it would burn the outer layer n raw inside, so i fried it using the lowest fire setting of my gas stove. Is that a mistake as the texture was kinda soggy n stick chewy most prob fr cornstarch? Should d outer layer be crispy? Taste wise delicious jz the texture bit. Thank you! I'm sorry but I never measure the temperature for deep frying. I used medium high heat on the gas stove to deep fry. 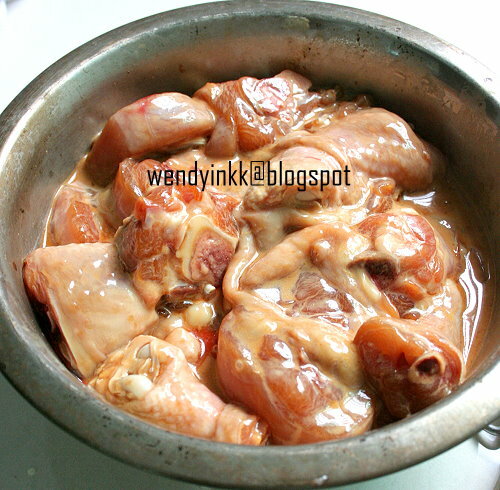 Since the chicken is cut to small pieces, it will cook through even if high heat is used. if i do not have Dark caramel sauce can i replace it with anything else? or omit it? In Singapore, you can find Angel brand thick soy sauce from Malaysia. I was told it is available at some supermarkets. But if not, just use dark soy sauce and adjust the taste, I do not know how the taste is like over there, but I heard it is not the same. The purpose of dark caramel sauce is only for colouring purpose, it doesn't have much taste.